A. J. Foyt Limited Edition Signature Bolens Tractor | In 1987, ten years after A.J. Foyt won his 4th Indy 500, and 20 years after winning his 3rd race, Bolens unveiled a Limited edition Signature Series Lawn Tractor. Randy's Lawn Mower Repair in Greenfield Indiana is announcing that they have it in Perfect, Never Sold, Never Used, Brand New, Museum Quality Mint Condition. This piece of History will soon be offered for sale to the highest bidder and sold for the very first time. This is a once in a lifetime opportunity for the True A.J. Foyt Racing enthusiest or Collector. About the 1987 A.J. Foyt Bolens Limited Edition Signature Series Lawn Tractor for sale at Randy’s Lawn Mower Repair in Greenfield Indiana. Photos of the 1987 A.J. Foyt Bolens Limited Edition Signature Series Lawn Tractor for sale at Randy’s Lawn Mower Repair in Greenfield Indiana. Randy is announcing that they have it in Perfect, Never Sold, Never Used, Brand New, Museum Quality Mint Condition. This piece of History will soon be offered for sale to the highest bidder and sold for the very first time. This is a once in a lifetime opportunity for the True A.J. Foyt Racing enthusiest or Collector. In 1987, ten years after A.J. Foyt won his 4th Indy 500, and 20 years after winning his 3rd race, Bolens unveiled a Limited edition Signature Series Lawn Tractor. Randy's Lawn Mower Repair in Greenfield Indiana is announcing that they have it in Perfect, Never Sold, Never Used, Brand New, Museum Quality Mint Condition. This piece of History will soon be offered for sale to the highest bidder and sold for the very first time. This is a once in a lifetime opportunity for the True A.J. Foyt Racing enthusiest or Collector. The 1987 A. J. Foyt Signature Series Limeted edition tractor has now been listed for Sale. This tractor is New and has never been used. It has been hept on a pedestal since being unloaded from the crate. It comes with Lots of Bonuses. In 1987, ten years after A.J. 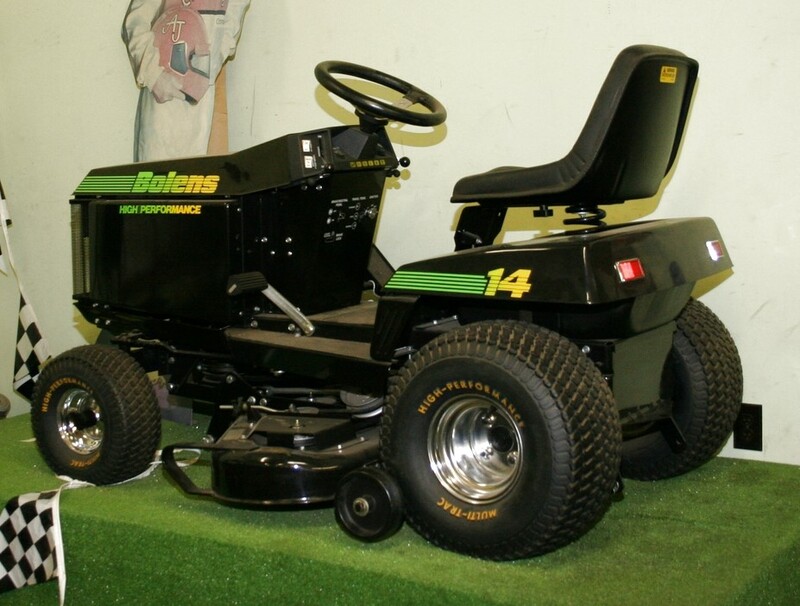 Foyt won his 4th Indy 500, and 20 years after winning his 3rd race, Bolens unveiled a Limited edition Signature Series Lawn Tractor. Randy’s Lawn Mower Repair in Greenfield Indiana is announcing that they have it in Perfect, Never Sold, Never Used, Brand New, Museum Quality Mint Condition. This piece of History will soon be offered for sale to the highest bidder and sold for the very first time. This is a once in a lifetime opportunity for the True A.J. Foyt Racing enthusiest or Collector.